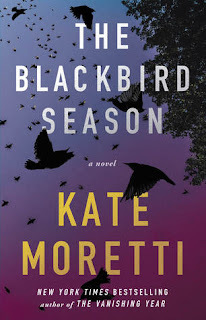 Kate Moretti is quickly becoming an auto buy author for me. I loved her novel The Vanishing Year, so I was incredibly excited to get my hands on a copy of her newest novel The Blackbird Season. This novel has a little bit of a different feel to it, but it was equally as addicting. I had a physical copy as well as an ebook, so I was constantly reading it whenever I had a free moment. The characters in The Blackbird Season are a little difficult to pin down. By this, I mean some were difficult to trust, others were difficult to like, and then some were just difficult to understand. I liked that aspect of the novel, but it made it a little harder to get truly invested in the novel. I loved that Moretti used different narrators throughout the novel, it really added to the intrigue and left the reader constantly guessing. All in all, the novel was fast paced and had a lot of twists and turns, but I had a hard time really connecting with the characters. It was full of suspense and thrills and I would recommend it to readers who enjoy psychological thrillers. Thank you to Atria and Kate Moretti for sending this novel in exchange for an honest review.